Over at Lavender and Lime, Tandy has set a Weekly Food Challenge to cook using citrus fruits. Anyone who pops over to my blog regularly will probably have noticed that I use a lot of oranges in my cooking, particularly salads, so I felt inspired to take part in my first ever challenge! I´m not sure if you´re allowed to submit two recipes, but I recently put up a post for one of my very favourite salads, Ensalada Cateta, so I´m putting that one forward too! However, I also thought I´d like to try something different and as I´m in jam making mode this week, I had a little play around with ingredients. After the visit from my friends from the UK last week I had a few limes left over from a Mojito session, so I took it from there. I love pears, but tend to either eat them as they are, or with cheese, or poached in wine. How about trying a chunky, spicy preserve instead? I could eat it on bread or toast, or serve it, almost like a soft quince jelly with cheese or, finally, as a sweet option drizzled over creamy vanilla ice cream. In the end I decided to marry the pears with lime juice and fresh ginger, and I have to say I was thrilled with the results. Just a hint of the tang of lime and the warmth of the ginger combined with the fresh taste of the pears. Pears contain a lot of water so I cooked the preserve for about half an hour for the quantities given below on a gentle boil. 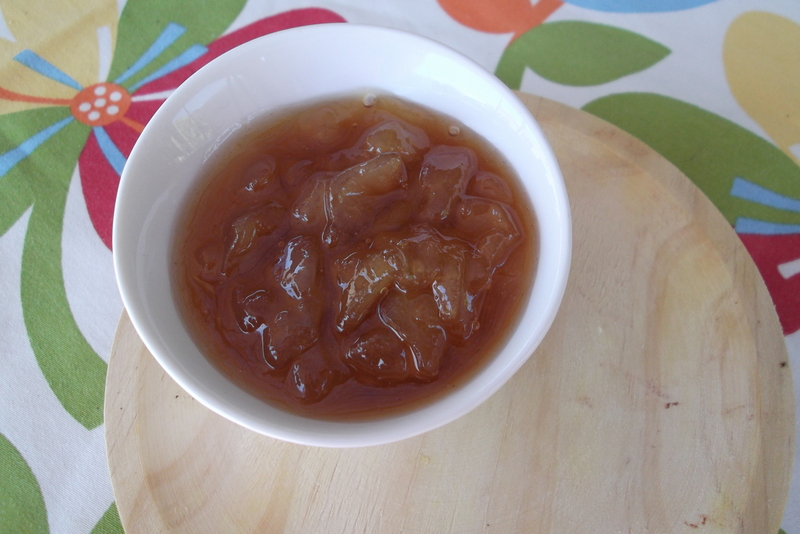 The final result left me with soft pear chunks which still held their shape and a jelly like syrup. For the method I used, please see either my Ruby Jewel Jam recipe or my Summer Cherry Jam recipe. This quantity gave me two medium jars of preserve. I do hope you enjoy it, it has an almost autumnal taste to it – I think it must be the ginger! Previous postCheers – It´s 4th July! oh divine! And thank you for taking part in the challenge! Thank you – it was fun to try something new! That looks wonderful! I love pear with ginger and the lime must make it even better. I think I´ll go made when I make it again (and I will be making it again!) and put the lime zest in too. Mmmm this really sounds so good. And as you said, an autumnal feel to it. I would love to serve this with a toasted herb baguette, some cheese and glass of prosecco! Ooh, that sounds good and I´m particularly liking the glass of prosecco!! This fruit spread looks wonderful! I love the combination of pears, lime, and ginger!! Like you, I use citrus fruits a lot. For example, I use lemon instead of using vinegar o salads and it tastes better!!! Oh those lemons – we planted a lemon tree when we moved into our house and now (finally) 3 yeard later, I can just walk out the door into the garden and pick a lemon! I always love ginger in things… it makes me desperate to get out the preserving pan!! Go on…get that pan out! Oh yum! I just bought two pomelo trees that will live in pots along with my other citrus trees (Meyer lemon, Mexican lime, etc – I love them!). One of the new ones has a fruit bigger than my fist on it already… I’ll keep you posted!